One police officer was fired and another retired after an internal investigation revealed they didn’t properly respond to an incident in which a man died. 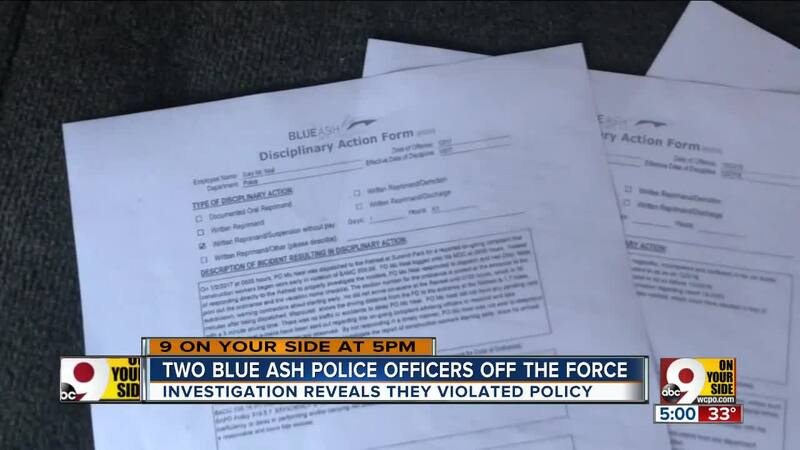 BLUE ASH, Ohio -- One police officer was fired and another retired after an internal investigation revealed they didn’t properly respond to an incident in which a man died. The Blue Ash Police Department terminated Patrol Officer Gary McNeal on Nov. 28, and Sgt. Edward Charron retired on Nov. 21. The investigation found the pair did not respond to an emergency situation in a timely manner and they violated police department policy by failing to turn on their lights or sirens. The internal investigation followed a June 26 incident where McNeal and Charron responded to Frisch’s on Plainfield Road for a man who was not breathing. The man had a heart condition, and he died at the scene, according to Blue Ash spokeswoman Breanna Gilroy. Chief Scott Noel, McNeal, Charron and another officer responded to the scene in separate vehicles. Noel said he does not typically respond to these types of situations, but he responded to this one because it was in a public place. The call came in at 11:30 a.m. as a man not breathing; a "possible suspected overdose," the investigation said. The fire department arrived first and rendered aid to the man. Noel was the first police officer to arrive on scene, about five minutes after call. Noel said this made him concerned about response time, and he launched an internal investigation on July 5. According to the investigation, McNeal arrived on scene at 11:36 a.m., five minutes and 21 seconds after the call. Charron arrived at 11:37 a.m., six minutes and 47 seconds after the call. “I want to make this very clear -- this was not the result of a citizen complaint, this was not the result of an investigative reporter finding we were doing something wrong -- this is something I personally observed, and then I ordered an internal investigation because this does not support the mission of the police department, and I won’t stand for it,” Noel said. Both McNeal and Charron were placed on administrative leave during the investigation. The other officer followed police department policy, Noel said. “The response of my officers did not have any bearing on the eventual outcome, but it was serious enough of offenses that I ordered the investigation," Noel said. The investigation revealed McNeal did not turn on his lights and sirens, which would have allowed him to respond in a fast, safe manner. Because he did not turn his light and sirens on, McNeal violated traffic laws on the way to the scene. He did not properly use the video recording system in his car, according to the investigation. McNeal was not familiar with department policy, and he lied during the investigative interview, officials said. Charron did not respond to the scene in a timely manner, the investigation stated. Charron did not use his lights, sirens or in-car video system, and he did not supervise the response according to policy. Charron also lied during the investigative interview, officials said. Blue Ash police officers do not have body cameras. The video and audio systems in cruisers automatically turn on when police officers turn on their lights and sirens. The in-car video can also be manually turned on. Neither McNeal or Charron used their video systems, the investigation revealed. McNeal has a disciplinary record that includes slow response, neglect of duty and disobeying orders. McNeal had been suspended three times, which was a contributing factor to his recommended for termination, Noel said. Charron has no documented official discipline since 2003. Charron was hired in May of 1995. He previously worked at the Cincinnati Police Department. McNeal was hired in 2001. He previously worked at the Colerain Township Police Department.